I was watching one of my students in the show ring last weekend. 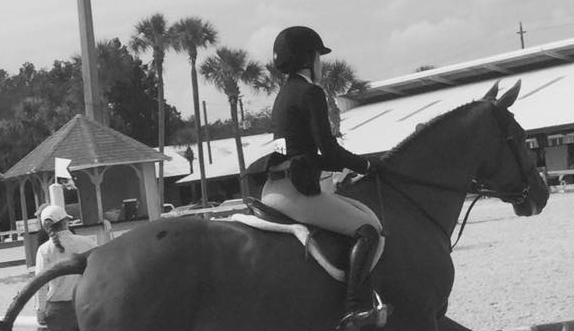 This rider was learning to ride a new horse, and she was using some techniques and habits that worked on her own horse, but not on the one she was presently riding. The horse was confused and reactive, since her aids didn’t make sense to him. Both horse and rider became frustrated. So I suggested taking a chance, and doing less. What if the rider quieted her aids, let the horse carry her, and trust she’d get to the other side without having to use her aids to shout at the horse? It was risky, and at first, the rider thought I was crazy for suggesting it. She reluctantly agreed to give it a try. Guess what happened? It worked. The horse settled and they ended up having a terrific show together. I make such a big deal about being clear with our aids, of being firm and precise when asking for something, but sometimes the important thing is to quiet our aids. Sometimes it’s not what you do, it’s what you DON’T do that gets the reaction you’ve been striving for. In your effort to dictate what you want, the horse may be telling you to try it another way. I have a young student whose pony sometimes likes to play “catch up” with the other ponies during their lessons He never runs off, but he’ll steadily quicken so he can get closer to his friends in the ring. Unfortunately this makes my little student tense up in an effort to hold him back. I encourage her to let go, once she’s asked him to slow for a few steps. It seems counter-intuitive that letting go would actually get your horse to slow down, but I always remind my students that it takes two to have a pulling match. Letting go often gets your horse to relax, and not feel like they have to surge through your aids to feel safe. When my tiny student takes a breathe and softens her reins at the right time, her pony takes a breath too, and realizes he doesn’t need to go anywhere fast. With all that said, often the release of your aids can be the most important part of riding. Without a pause – whether it’s a simple half-halt, or a walk break in the middle of our training session – we may ask over and over again, and never get the desired result. 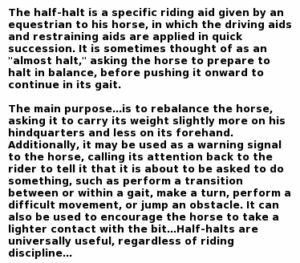 This leads to tension and inflexibility, sometimes from the horse, but most often from the rider. Caring too much (or micromanaging) can be the enemy of a successful ride. If we are unable to allow the horse freedom, their flight instinct takes over and tension is the result. How can you encourage the right response? First, you have to ensure you are asking for things in a way that isn’t confusing to your horse. The incorrect response from the horse is most often because he didn’t understand what was being asked. Once you ask correctly, you have to give the horse a chance to respond. You have to allow him to go forward, to get to the jump, to catch his own balance, and ultimately, seek the relaxation of your aids when there’s even the slightest positive response to your aids. Let go. Take the chance that your horse will do the right thing. When we relax, our horse learns to seek the release of the aids. We want to incentivize the horse to offer the right answer. It’s hard when we so desperately want control over the situation. It’s the same with human relationships. Our impatience, our assumptions, our biases can keep us from assuming others may do right by us. This sets the stage for unmet expectations and disappointment. Listening is more important than talking when having a conversation with someone. You don’t get anywhere if both parties are talking. So often, we are priming our own response before we take the time to actually hear what is being said. The give and take stops, and so does our ability to process what our conversation partner is trying to say. What you don’t say can make a difference – not holding back, but leaving open space – for meaning, punctuation, assessment, reward. Do you ever notice the white spaces on a page you’re reading? It’s there for a reason. It helps you find your place when you look away. It breaks things up, and it makes it easier to keep your focus. It’s necessary. All words and no white space is monotonous, oppressive and difficult to read. Think about your rides. Do you allow spaces for your horse to breathe, to show off, to express joy? They need an opportunity to process, to try, and eventually to show you they understand what you’re asking. Now think about your human interactions. Do you allow for a natural flow – a give and take for both parties? Are each person’s ideas fully expressed? Are you receptive to what the other person has to say or what they can do? We have a horse that is young and sweet. 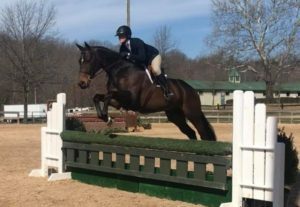 For a few months, he rushed the jumps, even more so when a rider needed to half-halt to make a stride fit. So he went more…just when going less was required. It was a conundrum. On top of this, he always did something strange: when standing in the middle of the ring awaiting his turn, he would always wander. He was never antsy or hot or unsettled. He would just creep. One step, then another. Slowly. It was annoying. We checked his teeth and made sure he felt physically alright, so there wasn’t an obvious reason for these habits. One evening, a rider of mine who has ridden him a lot decided to try jumping him without a bridle. She’d already ridden him on the flat without a bridle a few times, so now we were just adding jumping to his resume. When he had no bridle on, guess what? He didn’t creep. He stood like a statue. No wandering while waiting to go again. It was an epiphany – maybe he just didn’t like a bit. It was a smooth french-link snaffle, in case you were wondering. Maybe he needed something different. So the next day, she and another rider got out all sorts of bits, mostly soft ones, that would feel the least “bit-like” in his mouth. (He’s a hunter, so he has to go in a conventional bit at shows.) They eliminated the hunter-uniform martingale, too. Lo and behold: he went better. Quieter. No rushing. Just when most riders would think that “bitting up” a horse would be beneficial, to get him to back off and be more obedient, doing the opposite thing – using LESS – is the thing that worked. He’s happier. Bravo to my two riders for taking the time to figure him out! For many people, riding is a release from the daily grind of life. It’s the half-halt, the pause, the regrouping. It’s difficult to think about what you need to do with your horse, in the moment, while you’re thinking about a project that’s due, the fight you had with your mother, or what you want to have for dinner. Riding provides that mental break you need to re-group and re-energize. We need half-halts like our horses do. A half-halt that keeps going becomes a halt. You will never win the pulling match. The half-halt matters, because you are opening the door to something better on the other side. Embrace the possibilities by letting go.